Lazy Acres Riding Stables invites you to unwind, forget about traffic and schedules and take in the natural Arkansas Ozark beauty. Located in scenic Hardy, Arkansas, along the refreshing South Fork of Spring River, Lazy Acres caters especially to the beginning rider or to those just getting reacquainted with horses. 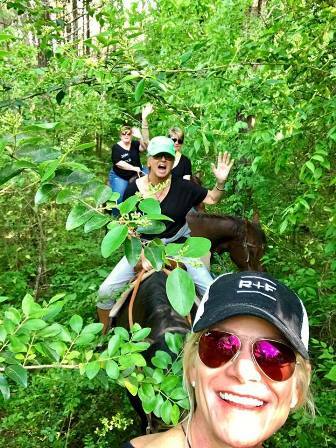 Our guided trail typically takes about 40-45 minutes and is a bargain at $10.00 per horse. Established in 1962, Lazy Acres has a long tradition of providing safe, family entertainment for horse lovers of all ages. Open daily, weather permitting, in June and July, and the first week of August. Open weekends in the spring and fall. For more information call 870-257-2131. All riders 18 years old and above must sign a waiver. Riders under the age of 18, must have a parent or guardian sign for them. Under Arkansas Law, an equine activity sponsor is not liable for an injury to or death of, a participant in equine activities resulting from the inherent risk of equine activity.